1. Impact – Floating above a darkened version of the web page, the juxtaposition communicates a sense of legitimate sponsorship. The ad creative provides an extremely effective vehicle for marketing. The presentation makes it clear: this ad is special, and you should pay attention to it. 2. Persistence – This ad unit remains on the page until the user engages with it, clicking either the close button (X) or the greyed-out page content (behind the ad). In short: message received. 3. Size – The Overlay can handle nearly any size. And it will automatically center itself within the viewport. 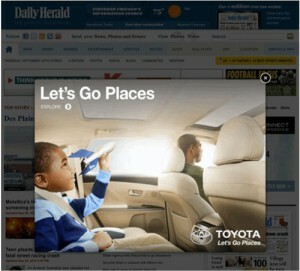 This Toyota ad is 768×576 pixels, but you could even run a standard 300×250 in this space. Reach target demographics, promote engagement and drive sales with streaming video channels in your market. Use your existing video or we can create video for you. 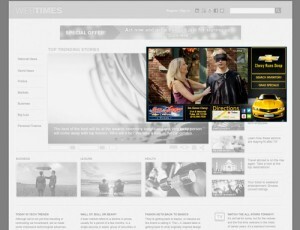 We serve your pre?roll video on the top video sites on the web. Target who can view the video by geography, demographics and behavior or Retarget/Remarket by keywords or visits to your site!